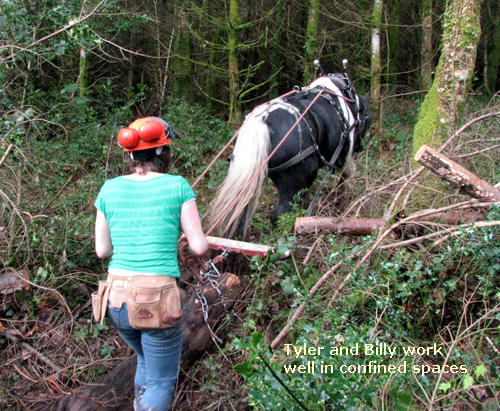 Barbara Haddrill has acquired many of the special skills needed for working with horses and doing so in restricted and inaccessible areas in forests and on steep land while living and working first in the Dyfi Valley near Machynlleth, Wales and then living in Llanrhaeadr-ym-Mochnant in the heart of the Tanat Valley. She has worked throughout mid and North Wales, Shropshire and the Welsh Borders and Marches. Since she acquired her first cob Tyler in August 2008 she has gained extensive experience doing horselogging, bracken and bramble control and harrowing for many public clients and private landowners. Between 2014 and 2016 she worked for the most part on a National Trust estate, Arlington Court, on the edge of Exmoor. Here she was responsible for managing a team of up to 6 ponies and delivering a programme of work and demonstrations. 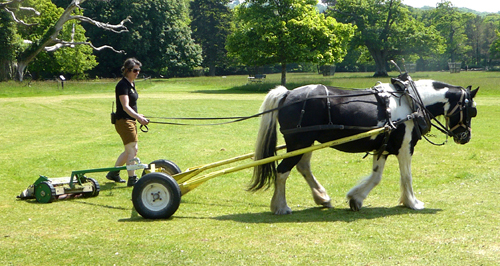 New skills such as driving the horsedrawn lawnmower (above), and training a team of pack ponies were gained, as well as continuing with the skills of horselogging, harrowing, carting and public demonstrations. Barbara is on the Professional Register of the British Horse Loggers. The BHL standard is very high and only those with a proven track record over a period of years are accepted. 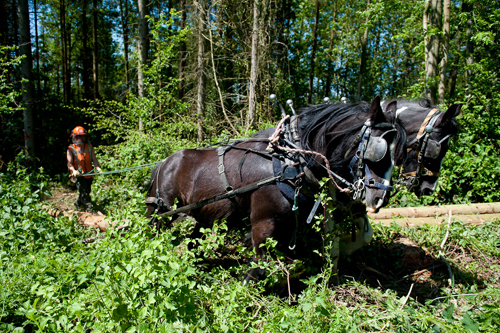 Their work is recommended by the British Horse Loggers. As well as being fully covered by Public and Employer's Liability Insurance, Barbara has an NPTC Chainsaw Licence 30, 31, 32 and a current First Aid at Work Certificate. Client references are available on request. Please contact Barbara direct by e-mailing barbara@carnog.co.uk or phone 07901741217. A free site visit can be arranged.